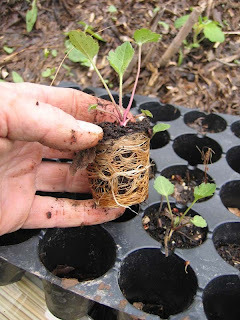 During this past Sunday's workday, Kim, Owen and I planted up more seeds, potted some green bulrush, and protected newly planted shrubs with cages and homemade stakes fashioned by Clark earlier in the week. Photos above: 1) Spicebush blooms on an island we're restoring just upstream of Mountain Lakes. 2) Native hibiscus sprouts in the greenhouse. This Saturday would be a great day to check out the Mercer Educational Gardens during the Master Gardeners' Spring Plant Expo. They'll be selling perennials and herbs from 10-2, Barbara Bromley will be on hand for Q&A, and there is always the grounds to explore, which includes demonstrations of some 17 different designs for compost bins. Photos and descriptions of these can be found on their website. The Gardens are a short drive out of town towards Pennington. More info, and lots of other things to explore, at www.mgofmc.org. One of the objectives of the Friends of Princeton Open Space is to restore habitat in the many natural areas the organization helped to preserve. Part of this effort is to use remnants of local biodiversity as seed sources for reintroducing species that for various reasons disappeared from other preserves. If enough of these wildflowers are grown, then we can start offering them to homeowners who want to improve habitat in their backyards. 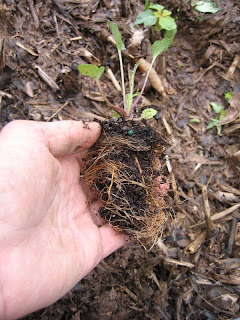 The seedling in the photo was grown last year from seed collected locally. Cutleaf coneflower is a showy native wildflower that prefers sun but still blooms in the shade, and can grow to eight feet. 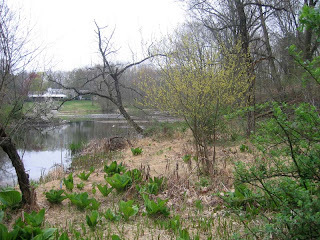 It grows in only a few spots locally, most notably along the towpath, but with some help could beautify floodplains, detention basins, preserves and backyards throughout Princeton. Here, it's being planted at Rogers Wildlife Refuge, as part of a habitat restoration project that began with the removal of the highly invasive Phragmitis reed by Partners for Fish and Wildlife. 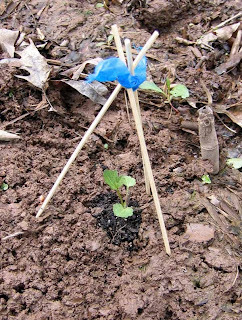 The rootbound seedling first gets its roots torn up (second photo), then gets planted, marked and (hopefully) protected from deer by a little tipi made of skewer sticks (an untested approach). Though watering probably won't be necessary in the marshy ground, we'll need to check back to make sure the smartweed sprouting all around doesn't overwhelm it. 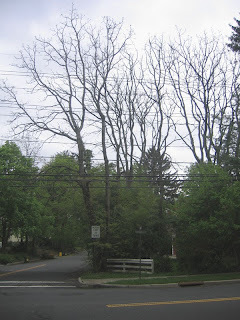 Here's one of the last holdouts from spring, still in its wintry hunch, bare limbs stark against a cloudy sky. Plants, like many authors and movie stars, have two names. The common name for this not very common tree is Kentucky Coffee Tree, which refers to the resemblance its seeds bear to coffee beans. It's scientific name is Gymnocladus dioicus, which may refer to its way of losing leaves early in the fall and sprouting them late in the spring. Gymno means naked. This photo was taken four days ago. Spring is in such a pellmell rush right now that the scene has already changed, but for a few days anyway you could spot every Norway Maple in town if you knew what to look for. 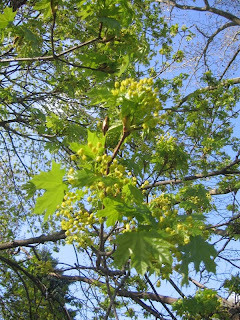 Their flowers and emerging leaves made a distinctive flush of yellow-green, just ahead of most other trees. If you were keeping your head down, you could still see their tiny flowers fallen onto the sidewalks. Like the barberry bush, the Norway maple is an exotic that can be very invasive. It pops up along the fencerows of people's yards, and before they know it, they have a large bully in their yard, pushing up into the canopy of more favored trees, making such dense shade and grabbing so much soil moisture that nothing can grow underneath it. Though it has long since lost favor in the horticultural trade, its self-seeding and capacity to tolerate shade insures it a place in Princeton's default landscape. I would like to say something nice about a shrub that, despite one very cool characteristic, is being cut down as part of the habitat restoration at Mountain Lakes. Barberry is a commonly planted shrub, used as a hedge in many yards. It's generally around 4 feet high, has small leaves and small thorns on its stems. This time of year, it sprouts lots of small flowers, white or yellow. Back in my college days, we learned in field botany that if you tickle the flower at the base of the filament, the anther will slap against the stigma. All of which is to say that if you take a small leaf blade, stick it into the flower and look closely, you're likely to see a sudden, quick motion. When a bee pays a visit, its legs probably poke into the flower and trigger the anther to slap against its body, thereby giving the bee a dose of pollen that it will carry along with it to other barberry flowers, thus serving the cause of pollination. Another interesting aspect of barberry is the bright yellow of its inner wood, which you will discover if you cut it down. 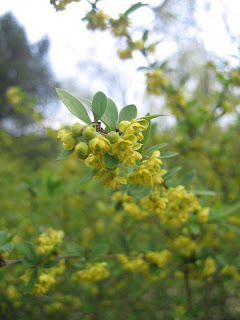 Though barberry is not as highly invasive an exotic as multiflora rose in local preserves, it's bad enough to make one wish people wouldn't plant it, and would consider removing it from their properties so there are less seeds to aid its spread into wild areas. In the meantime, the flowers can be entertaining. This Sunday's habitat restoration workday will run from 9:30 to 11:30am at Mountain Lakes. A description of last week's workday is below. It's a busy time of year: more wildflower seeds to plant in the greenhouse, shrubs and wildflowers started last year to plant in areas cleared of invasives. 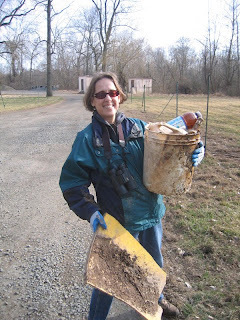 This is prime time to pull garlic mustard--the biennial invasive herb (to get acquainted with this weed, check out photo in May 2, 2007 post on this blog). If you'd like to join in, please wear work clothes, leather gloves, and bring tools if you have them. A shovel or spade could prove useful. For anyone wishing to work more on invasive shrub removal, bowsaws, loppers or pruning shears are handy. I'll have a few extras. 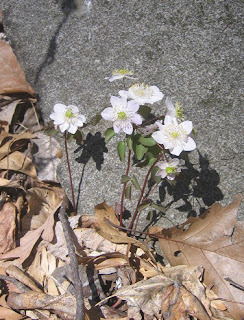 As you drive up the driveway at 57 Mountain Ave, you'll likely see the blooms of spring beauty and flowering dogwood. We'll meet in the gravel parking lot just before the house. Last Sunday's workday was very productive. Clark and Brownlee fashioned deer guards for the native shrubs grown last year in the greenhouse (photo above). 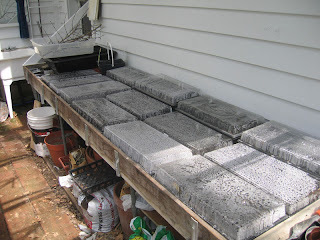 Kim planted more wildflower seeds in trays, while Brownlee cleaned seed. Annarie and her son cut more invasive shrubs in the valley west of Mountain Lakes House. 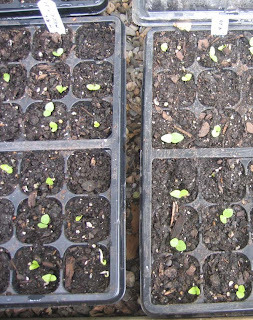 Already sprouted in the greenhouse are Rose Mallow Hibiscus, Late-Flowering Boneset and Fringed Sedge. A typical scene in a Princeton preserve this time of year, with exotic shrub species greening up while the native trees are still dormant. 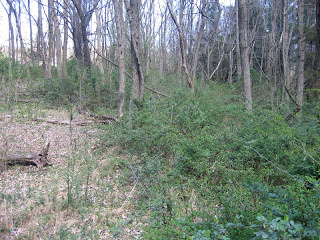 Most of these shrubs are multiflora rose, which bears thorns that will punish anyone daring to explore the woods. Removing these highly invasive shrubs has been a big part of our habitat restoration efforts. Recently, though, I've become aware of a quiet accomplice to our efforts leaving signs of its work--signs that grow less subtle with each passing year. 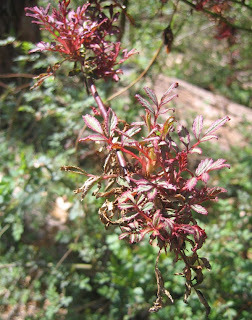 Rose-Rosette Disease, which causes infected multflora rose bushes to sprout dense clumps of distorted, red leaves, has been spreading through Mountain Lakes Preserve, and in some cases has killed shrubs completely. We can dream that the virus, which has been spreading eastward from the western U.S., apparently spread by a tiny native mite, will eventually wipe out this prolific, intimidating weed, but it's much too early to tell. There's also the possibility that the disease will pose a threat to the native swamp rose and cultivated varieties. Still, at this juncture, there's reason to entertain hope. 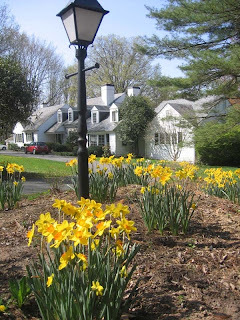 Thanks to the Garden Club of Princeton, whose members donated bulbs, time and effort to brighten up the grounds next to Mountain Lakes House. The house, which is owned by the township but leased to Friends of Princeton Open Space (FOPOS), is rented out for weddings, parties and other events. All income beyond expenses helps support land preservation and restoration efforts in Princeton. In addition, the Garden Club of America, through a recommendation by the Garden Club of Princeton, gave an award to the FOPOS board this year "For their devotion to the preservation of open space and increasing environmental awareness in and around Princeton, NJ." Daffodils, by the way, are an example of a non-native species that doesn't spread into local woods and fields. The Last Flower, or the First? An improbable flower blooms on a slope overlooking the Mountain Lakes in Princeton. It's a bloodroot, the only one of its kind in the preserve, as far as I've been able to tell, and it wouldn't have been noticed at all if not for some observant weekend hikers. 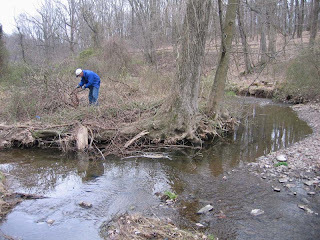 I had been pulling up honeysuckle shrubs while my daughter built a stone house for an earthworm family along the creek--"so they can get married," she reported to me. We were about to leave when Owen and Marilyn came along. They had just noticed the flower, and showed it to us back up the trail. The suspense now is whether this lone flower will have its daring investment in leaf and flower wiped out by a passerby--deer or human--or will be able to produce seed and spread. 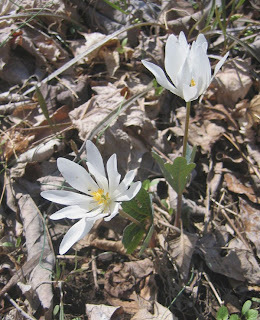 Another wildflower that's very rare in the preserve is windflower. I found only two patches of this species, maybe ten plants total. They can easily be mistaken for spring beauties, which are much more common. 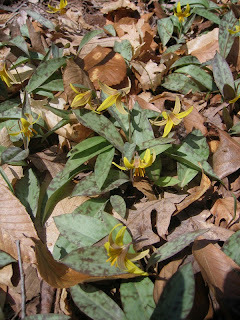 Common as the spring beauties are the trout lilies, though few of them actually produce flowers, for some reason. Many factors have made wildflowers rare in the preserve--past plowing, the high deer numbers, the competition for sun and water from invasive species. The wildflowers are most numerous in places that were not plowed, such as along old roadways, in floodplains and along the lake edge. We made more progress last Sunday. Clark cut invasive shrubs on the island just up from the lakes, and I planted about 40 more live stakes of silky dogwood, elderberry and buttonbush. This weekend, I'm going to take a pause from field work to devote time to getting square with Uncle Sam, and will also take GPS readings to figure out how close we are to clearing brush from 4 acres, as FOPOS is contracted to do for the WHIP habitat restoration grant. Thanks to all who have helped thus far. Birds don't have cell phones, so how were we to know that the birdhouses at Rogers Refuge were so full of previous years' nesting material that there was no longer any room for the birds? Maintenance--the eternal battle against entropy--is most often encountered with its sidekick modifier "deferred." The act of maintaining is an expression of love, increasingly rare in a hurried, throwaway age, and is to be celebrated whenever and wherever it happens. 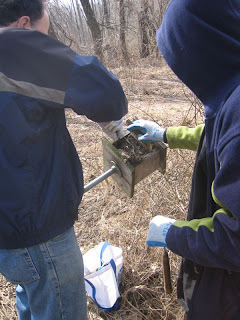 On March 15, Fred, Winnie and Alex Spar took the possibly unprecedented step of cleaning out and re-positioning the many birdhouses at Rogers Wildlife Refuge. Most were jam-packed with a decade's worth of nests. 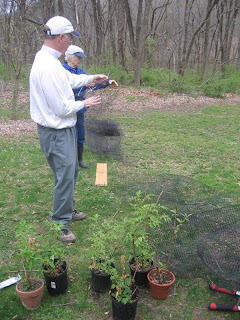 Fred and Winnie are both members of the Friends of Rogers Refuge (FORR)--the volunteer organization that works with the water company and the township to manage this haven for birds. Fred serves as president of FORR. Visitors to the Refuge will notice some curious yellow tubes proliferating around the edges of the marsh, like Chinese lanterns. 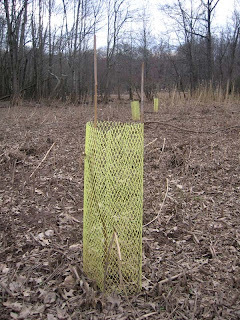 These have been installed to protect "live stakes" of native shrubs planted this spring. If all goes according to plan, this field, which until last year was dominated by invasive Phragmitis, will become populated with silky dogwood, buttonbush, elderberry, and various species of wildflowers grown from locally collected seed. Working our way down the valley towards the lakes at Mountain Lakes Preserve, cutting down invasive shrubs as we go, we came upon an island. Or, rather, Clark came upon an island, and has been spending some spring afternoons relieving it of a long-held burden of the usual suspects--multiflora rose, privet and honeysuckle. A big ash tree stands guard at the upstream end, splitting the stream in two and preventing periodic floodwaters from carrying the island's soil downstream into the lakes. In the course of removing exotic species, some native ones have emerged from the tangle. 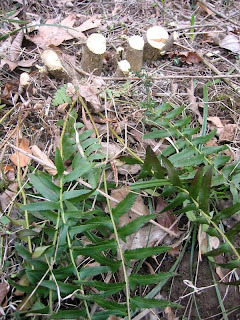 Below is a Christmas fern, growing at the base of a privet, and just about to send up a new crop of "fiddlehead"-shaped leaf shoots. Other natives discovered on the island are elderberry, spicebush and wild indigo (Amorpha fruticosa). 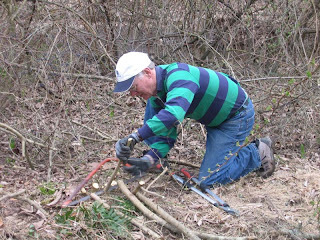 Clark, who is enjoying a very active retirement, has also been cutting down invasive shrubs along many of the Mountain Lakes trails he walks daily. Thanks to volunteers like Clark, the landscape at Mountain Lakes is becoming more and more a place to nourish wildlife and the human spirit. These cool, grey days aren't very springlike, but take a look amongst the dull brown leaves at Mountain Lakes, or most anyplace in Princeton that's within a stone's throw of a creek, and you're likely to see the wave of growth beginning its quiet surge. 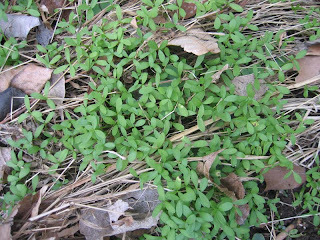 Two annuals--one native, the other introduced from Asia--are sprouting in abundance. 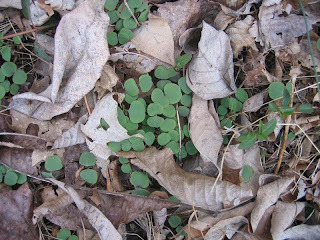 The first photo shows native jewelweed, which will grow to three feet and offer orange or in rare cases yellow tubular flowers to the hummingbirds all summer long. It has gelatinous sap that is used to treat poison ivy. If you put one of its leaves underwater, it will suddenly appear metallic silver. The flowers hang like earrings. Either one of these features could explain the common name. It's also called Touch Me Not, which refers to the spring-loaded seeds that explode when you touch the pods. But for now, they are just tiny sprouts among the dull leaves on a grey spring day. Some day I will commit an hour to counting how many Japanese stiltgrass sprouts come up in an average square foot of Princeton soil. Multiplied by how many square feet Princeton contains, the figure will no doubt soar into the trillions and beyond. There are whole meadows of this stuff in Princeton nature preserves, which means there is precious little room for native species once the stiltgrass gets through hogging all the nutrients, water and sunlight. It also changes the soil chemistry, which can have ecological ramifications. People think of Kudzu as the ultimate invasive weed, but it's these little fellows that come up by the trillions that are turning our preserves into monocultures of plants no wildlife will eat. I've heard that jewelweed is an invasive problem where it has been introduced in Europe. I wish that ecosystems had mechanisms for quickly bringing new species into some sort of balance, but wildlife seem to adapt their tastes very slowly, if at all, giving the uneaten exotics a huge competitive advantage. EEK! There's a bug in the house! Call the police. Vacate the premises. Secure the perimeter. There's a bug in the house, and it's ready to attack. Having been alerted to the situation by a distressed family member, I courageously approached the beast, armed with an insect identification book fully loaded with images and text. I fumbled through the pages, searching fruitlessly for a name with which to peg the intruder. Fortunately, my trusty companion Google was nearby, and soon gave me the lowdown on what I was up against: a fully grown Brown Marmorated Stinkbug! Not wishing to engage this fearsome fellow in head-on conflict, I decided to let it crawl up on my finger, from which perch it was able to observe me starting to type this blog entry. Apparently in an attempt to do some editing of my description of events, it decided to hop down on the keyboard--dangerous territory for a highly squashable true bug, given the forest of flying fingers. By the time I thought to put it outside, it had already slipped off the keyboard and disappeared. I reported happily to the family that everything was under control. Like another frequent indoor visitor--the Asian ladybug beetle--the brown marmorated stinkbug is not native to the U.S. It reportedly can raise a stink if it wants to, or if you crush it, but I didn't have a chance to find out. 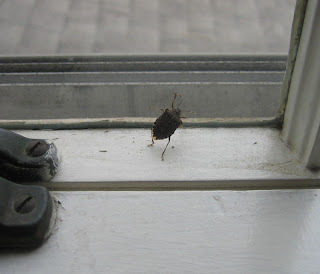 There are many colorful stinkbug species, but this is not one of them.